The Toughest Underbody and Tarp Tool Boxes on the highway! Need a tool box that will last 1,000,000 miles? As seen at The International Trucking show, Las Vegas Convention Center, Heavy Duty Trucking, Trailer Body Builder, Equipment World, Concrete Contractor, Light Truck & SUV, Fleet Equipment, Trucker's Connection, Through the Gears, My Little Salesman, and Fleet Owner magazines. 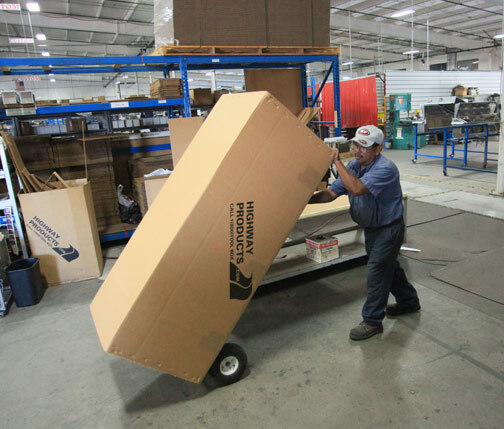 Highway Products Inc., established in 1980, built its reputation on manufacturing the toughest semi truck and trailer underbody tool boxes on the planet. 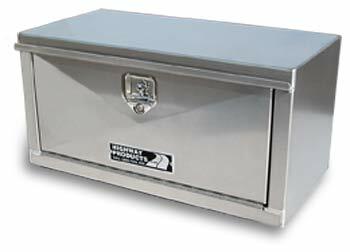 This unique line of tool boxes features no-sag doors and is constructed of the thickest grade of aluminum stock utilized in the industry: 1/8" marine grade aluminum. 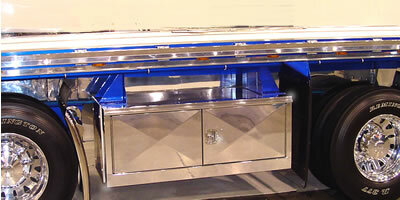 Underbody tool boxes are often overlooked when ordering trucks and trailers. They all have similar looks on the outside and seem very simple. Take another look before you order. Gene Gros - President of Highway Products, Inc.
Look at the metal thickness - if it's not 1/8th inch thick it will not last! Road conditions are just too tough. Look at the hinge. Does it look oversized? If not, it's not tough enough. Are the hinges stainless steel? How about the way the hinge is fastened. Rivets often work loose after time. This could be the weakest point of the tool box. How about the inside construction of the tool box. Is it fully gusseted? Does it look like you could build a house on top of it? Are the locks super tough? They better be. If you're putting heavy or awkward items in the tool box, do the doors open to the sides? If not you will be leaning over the drop door to load and unload. Not a back saving feature. 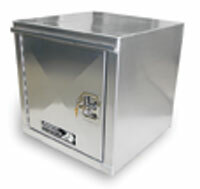 Highway Products tool boxes are reinforced and reinforced again. That's why they last for millions of miles. We didn't get our reputation from skimping. If the hinge isn't this big, its not big enough. Stainless steel Torx™ screws are the toughest fastener there is. 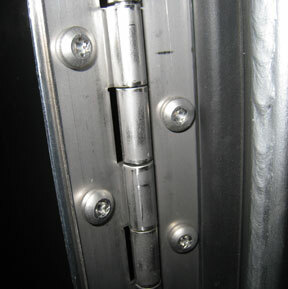 They don't loosen and allow the door to be replaced without special rivet guns. Also notice the beefy size of our 3/8 knuckle, stainless steel hinge. One of the weak points of underbody truck tool boxes is the bottom corners. There is so much road stress from carrying heavy tarps, chains, tools, and other equipment, the corners sometimes break. 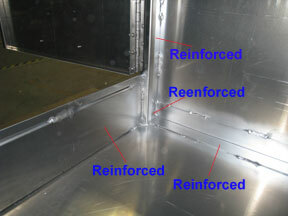 Highway Products has eliminated this problem with reinforced angle bracing welded in the corners. (larger tool boxes only) This also gives a double thickness to bolt through when using a cradle type mounting system. Want to add powerful looks to your truck or trailer? You could be using your tool boxes every day to access your tarps, chains, straps, tools, and other equipment. So make sure to take a second look at the tool boxes before you buy. There can be a lot of difference for only a few dollars. You will save money, your back, and time in the long haul because you took the time to see the difference. How many times have you seen tool box doors being held shut with bunji cords or flapping open in the wind. This in not what you want to see on your truck. 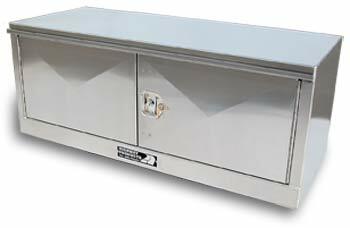 Highway Products underbody truck tool boxes have internal design features that make them extra tough: 1) the larger semi truck tool boxes have both a 1/8" "C" channel stiffener bar welded in the bottom front corners and fully-welded top-to-bottom inside vertical posts. 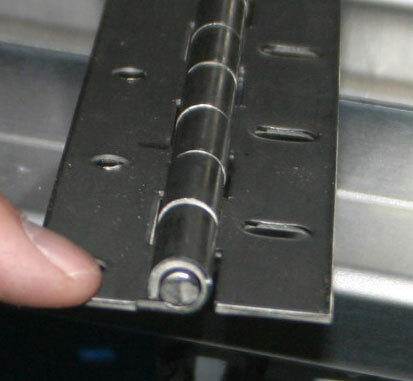 (features ruled out by other manufacturers due to the extra expense); 2) An oversized continuous stainless steel piano hinge attached with unshakable, 1/4 inch stainless Torx™ screws (not rivets) and assures long term performance. Torx screws also allow you to replace a damaged tool box door without special tools and expense; 3) The same Heavy-duty "T-handle" stainless steel locks and mechanisms we have been using for 30 years. Keeps your valuables secure. Plus, a five year "no-nonsense" warranty for that warm fuzzy feeling. Doors that will never sag and don't need bunji cords to keep them closed. 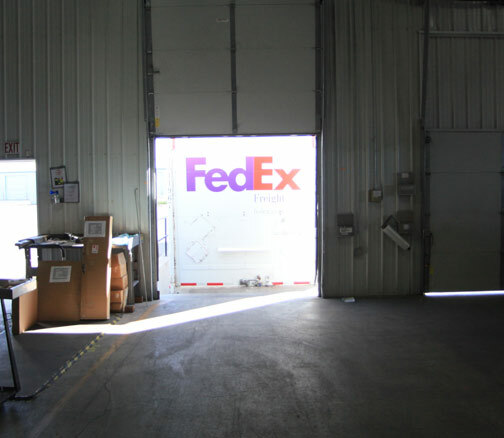 The doors of our double-door, side open underbody tool boxes close into the frame of the box. The frame style underbody tool box keep the doors protected from road debris and even bottoming or in a high center situation. 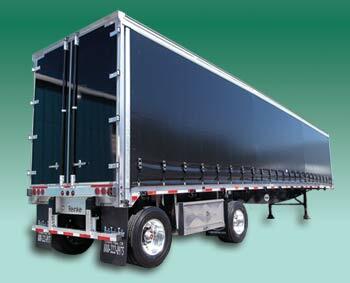 We have seen many times where the trailer has been high-centered on railroad tracks, dragging the underbody tool boxes, and actually lifting the trailer off the ground while dragging. Afterwards, only minimal damage to the bottom of the Highway Products underbody tool boxes. The doors still worked fine. We've seen where the trailer was dropped, fully loaded, without the landing gear down. The boxes took the full force. Minimal damage to the underbody tool boxes and the doors still worked fine. Our customers have been transferring Highway Products tool boxes from their old trucks and trailers to their new ones for over 20 years, because they last. This means millions of miles! They are truly the toughest tool boxes on the market. Remember, you will be using these boxes for a long time. Get good ones! Need custom sizes? No Problem! 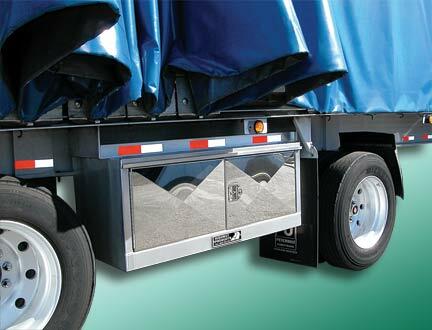 Our Full Faced (shown on left) underbody tool boxes are equipped with an internal rain gutter. This makes for a very water tight underbody tool box. Highway Products developed this style of internal rain gutter in the early 80's and since has been copied by most other manufactures because of it's ease of manufacturing . 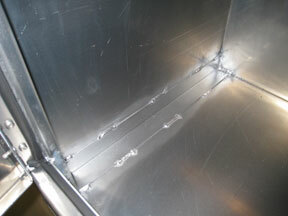 We use this style of underbody tool box where it performs best for the situation. Still a great tool box. To properly support underbody tool boxes and their contents, we always recommend mounting them in a cradle type of mounting system that does not allow side-shifting. We call side-shifting the travel the tool box moves when stopping and starting. This undesirable travel tries to tweak the tool box which works hardest on the corners. 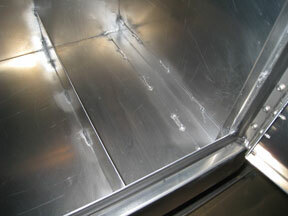 In fact, our experience shows most of the problems with underbody tool boxes are due to an inadequate mounting system. Because of cost and circumstances it is often more desirable to mount from the sides of the tool box. 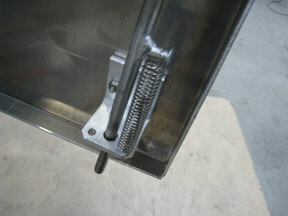 So we offer two mounting systems: Please visit our mounting bracket page.